The St. Michael School, defending double crown champions of the Powerade-sponsored Barbados Secondary Schools Athletics Championship, lead both the girls and boys standings. But today’s real champion was Shemia Odaine of the Lester Vaughan School. 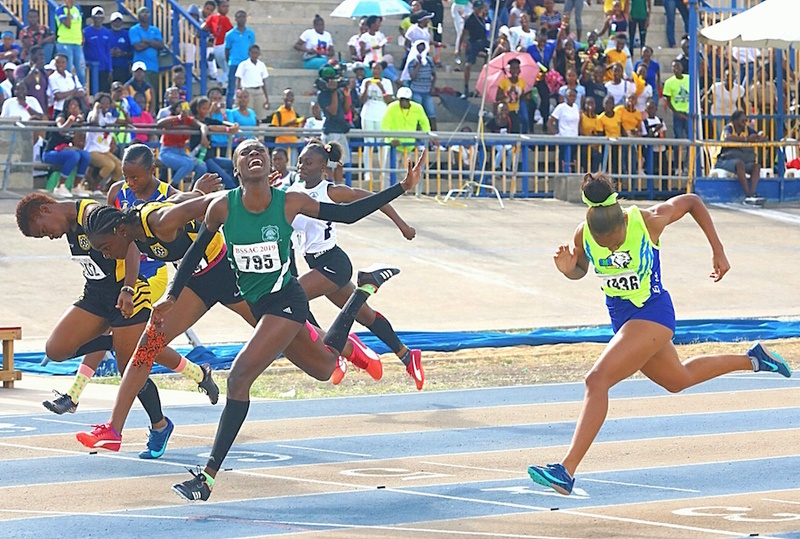 The two-day final commenced today at the National Stadium and the rivalry on and off the track for bragging rights in both the boys and girls overall standings was an exciting affair. Joint BSSAC girls champions St Michael School (179.50) and Christ Church Foundation School (167) are the two out front in the girls tally while perennial queens Springer Memorial on 128.50 points are third. Queen’s College on 108 points occupy the fourth position while Combermere with 85 points are in fifth place. Harrison College (103 points) were ahead in the boys’ standings going into the relays but they were overtaken by the defending champions the St. Michael School on 107.50 points. Foundation are closely trailing on 99 points, Combermere School tallied 89 points for fourth place and the Lester Vaughan School on 73 points are fifth. The Under-20 Girls champion Odaine picked up her first medal in the long jump with a 5.86m measurement. Coached by veteran professional Alwyn Babb, Odaine then pulled off a major upset when she clocked 55.63 seconds to accomplish gold in the 400m. Returning later in the afternoon, Odaine earned the right to be called the fastest schoolgirl in Barbados when she ran 12.13 seconds in the 100m for her third victory of the day. Those outstanding performances were witnessed by the majority of spectators who occupied the Louis Lynch and James Wedderburn stands. Just one record fell on the day in the junior girls shot put (11.36m) via the powerful arm of Ryah Dates of Queen’s College. Dates was also victorious with a 31.66m throw in the junior girls javelin. Julian Forde of Harrison College established himself as the fastest schoolboy in Barbados with a blistering personal best of 10.47 seconds in the Under-20 Boys 100m. CARIFTA qualifier Kyle Gale of St Michael School ran 47.06 seconds for a top podium finish in the Under-20 males 400m which featured Delano Wickham of Foundation (47.71) and Miguel Nicholas of Ellerslie School (47.95). The 100m hurdles for Under-20 Girls went expectedly to Sarah Belle of Foundation (13.79), Anika Blackman of Princess Margaret (14.51) was the best in the Under-17 100m hurdles while Brieanna Boyce of Alleyne School (28.55) ran away with the Under-15 Girls 200m hurdles. Winners of the boys’ hurdles races were Ialpha Nedd of St. George Secondary (14.93) in the Under-20 110m, Haile Emmanuel- Turney of Lester Vaughan (14.54) in the Under-17 110m and Josiah Parris of St Michael (42.30) in the 300m. Deighton Griffth swept the Under-17 100m sprint through Rickyla Fagan who lived up to expectation when she clocked 12.23 seconds while Kristin Cummins (11.11) was the best among the boys. Sakena Massiah was a class above the rest running 57.42 seconds for the Under-17 Girls 400m honours representing the Alleyne School. The boys 400m went to Savion Hoyte of the Lester Vaughan (49.13 seconds) in a race that went down to the wire with Aren Spencer of Harrison College (49.24) in second place. The Under-13 and 15s 200m final took place and Keshawna Niles brought glory to Deighton Griffith in 24.94 seconds while the Under-13 Division went to Alika Harewood of Foundation in 26.96 seconds. Winning the Under-15 Boys 200m was Josiah Parris of St Michael School (22.86) while Shamari Addison of Queen’s College (25.14) won the Under-13 200m. In the distance races, Foundation picked up two gold medals through the efforts of Daesha Brathwaite in the Under-17 Girls 1500m and 3000m. In the first race on track today, Brathwaite finished way ahead of the 3000m field as she clocked 11:32.49 while in the 1500m she registered a time of 5:15.06. It was the Combermere School show starring Nathan Goddard-McCarthy with a brilliant first place run of 4:10.31 in the Under-20 Boys 1500m. Meanwhile, Ethan Taylor also of Combermere captured the junior boys 3000m in 11:02.00. Harrison College were dominant in the girls 800m and 1500m races. CARIFTA qualifier Layla Haynes ran a wonderful race of 2:28.29 in the Under-15 Girls 800m while Charissa Moore at a modest pace cruised to a 5:06.32 finish in the 1500m. Winning the girls Under-13’s 800m was Dominique Odle-Browne of Combermere School (2:38.67), Nikolai Clarke of Coleridge and Parry (2:29.73) won the Under-13 Boys. Kamili Brathwaite of The Lodge School (2:12.22) grabbed the Under-15 Boys 800m win. St Michael School are ahead in the girls and boys and they accumulated vital points competing in the field events. The girls from Martindale’s Road captured four gold medals led by Tenielle Chapman-Goodluck who threw 11.98m in the shot put while the bronze went to schoolmate Krishonda Myles (10.16m) and Julisa Jones- Smith of Springer Memorial (10.77m) split them for the silver. The Massiah brothers Aaron and Caleb performed very well for St Michael School. The younger Massiah (Aaron) won the Under-13 boys’ high jump (1.55m) and Caleb landed at 6.79m in the Under-17 long jump. Meanwhile, Gabriel Browne also of St Michael School (40.19m) picked up a win in the Under-20 Boys discus. Vanessa Greaves also of St Michael executed a winning 38.59m throw in the Under-17 Girls javelin. St Michael also won two gold medals in the javelin thanks to 1.37m by Kijana Johnson in the Under-13 Girls Division and a 1.58m height by Samiya Dell in the Under-15 age group. CARIFTA qualifier Shanice Hutson of Coleridge and Parry (11.91m) claimed the Under-20 Girls shot put. Also in the senior Under-20 Girls category Rowland Kirton-Browne of Lester Vaughan threw 37.88m which was good enough for a first position in the javelin event. Kirton- Browne then went on to clinch another top place finish in the shot put (12.06m) for the Cane Garden, St Thomas-based school. Four 4x100m relays ran today, St Michael (girls) in 47:34 seconds and Foundation (boys) 40:76 seconds stamped their authority to win the Under-20 Division. The Under-17 age group went to Springer Memorial (48.33) and Queen’s College (43:62). Please also see Pages 42 & 43.